Let me get this off my chest - I am one of Jennifer Echols' biggest fans. Every book of hers that I've read I've loved; every main character she has written about I've come to care about. I loved how she courageously tackled such heavy issues in both Forget You and Going Too Far (and she did such a bang-up job too! ); I loved how her writing isn't stilted in any way - her words just flow, and I found it impossible not to finish her novels in just one sitting. 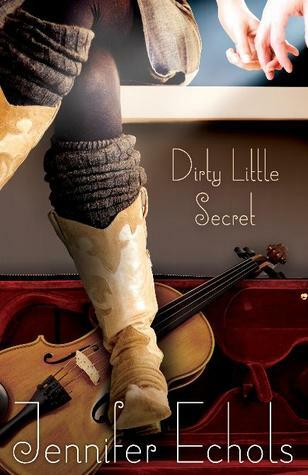 Suffice to say I was ecstatic when I got the chance to participate in a blog tour for Dirty Little Secret, and once I received my e-copy, I immediately settled down with my kindle and began reading. This is the first YA novel I've read set in the world of country music, amd this is actually one of the reasons why I was foaming at the mouth (okay, this might be a slight exaggeration) to read this book. True enough, Echols didn't disappoint - from the get go, I was thoroughly immersed in the country music culture, from the people of Nashville's sheer love of music to the downs and outs of fame in this world to those seeking it. I'm not really that well-versed with country music as a genre (and a culture, while we're at it), so I'm not able to say with a hundred percent conviction whether or not this aspect of the novel is accurate from every nook and cranny per se - but I can say with no qualms whatsoever that I enjoyed soaking in this world that I've heard so much about, yet have never taken the time to know more about. I've always found Echols' novels to be raw and gritty, and this was no different. In fact, I would even go as far as to say that this is even darker, even a little depressing, than her previous works. Reading about Bailey's life was initially VERY difficult - imagine having the life you know snatched away from you at the blink of an eye. Imagine being deemed collateral damage in the face of your sister's dream... despite of the fact that you yearn for the same thing. I cannot begin to swallow how awful it must have been to be cast side by the people who are supposed to love you unconditionally. Moreover, the way Bailey's mom treats her left a sour taste in my mouth. No mother should make her child feel like she is a waste of space, however, sadly, there are mothers out there who actively who do so. Bailey's situation is just horrifying. Nonetheless, I can't help but admire Bailey's character. Here she is - her family's dirty little secret; the secret that can never be discovered at all cost because Bailey's sister cannot have bad PR when she debuts as a country singer - and yet she's willing to cater to her mother's (and her sister's recording company's) whims simply because that how much Bailey loves her younger sister. (Sorry for that abnormally long sentence!) That kind of love is fierce, real, and seldom chanced upon. Here you have this character who only wants unconditional love and support from those she cares about the most, and despite not getting that, she's still able to love her sister with such intensity. My biggest qualm about this novel would have to be the love interest, Sam. I really didn't like him. At all. He wasn't the best person to stand by Bailey when she needed someone to lean on - as a matter of fact, he ended up pushing and prodding Bailey for a chance at stardom because of her sister's fame. He was manipulative, and it was frustrating to see Bailey be continually manipulated by this supposed guy who was supposed to love her. Suffice to say I don't think he was good for Bailey. The ending was great. I love how Bailey finally stood up for herself and her dreams. While this is not my favorite Echols novels, I think that many others out there would be able to enjoy this one. Your review makes me want to read this book!!!!! !